BlackBerry knows that success with its new BlackBerry 10 OS relies on getting the new software into the hands of the people it hopes to convert. What better way than through the devices they are trying to overthrow. In a cunning marketing move, BlackBerry has designed an interactive experience that let's users test drive the new BlackBerry 10 OS in the browser of the smartphone they have in their pockets; namely iPhones and Androids. The tour takes you through several of the key differences between BlackBerry's new OS and the current market leaders, focusing on how the Hub works, the predictive keyboard and the Time-shift camera. Our hats are off to BlackBerry for this clever approach to one of its major customer obstacles, it's just a shame that these sorts of demos don't work very well using mobile browsers. For starters, the demo is a guided tour and not a free-flowing trial of the system. You follow the onscreen instructions and move from section to section. It is a shame that there isn't a screen of instructions followed by free use of the gestures to play around. It is also painfully slow, and while we understand why this is, we wonder whether all of the people BlackBerry is targeting with this site will understand too. It would be a shame if they assumed the real BB 10 system was as clunky to use. If you can look beyond these quibbles, it is worth a look. 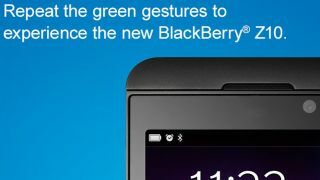 Go to blackberry.com/glimpse, but remember, you'll need to use phone's browser to see it.